At the end of May I’ll be going to Montevideo to participate in a collaborative project with six Uruguayan visual artists. Coming with me will be eight artist friends, fellow members of Take Me to The River (TMTTR), an international artists’ collective, of which I am a co-founder and project director. TMTTR was born in 2002 when my friend Mansoora Hassan, who was living in Cairo at the time (but calls DC home), was asked by the Egyptian Minister of Culture if she would like to arrange an exhibition there. Mansoora invited me and two other DC-based artists (Judy Jashinsky and Betsy Stewart) to exhibit with her. Because we are four very different artists, we needed a theme to make the exhibition cohere. After much discussion, we decided the theme should be water. Then, at a meeting in my studio before the exhibit, Al Green’s song Take Me To The River was playing in the background. Great song! About water. The Nile and the Potomac. One thing led to another, and the Cairo exhibition grew to be eight artists: four Americans and four artists from other countries living in DC. The Cairo exhibit became the first expression of the artists’ collective, Take Me To The River. Now there are 16 permanent members of TMTTR, including Joan Belmar, John Brown, David Carlson, Eglon Daley, Victor Ekpuk, Mansoora Hassan, Deirdre Saunder, Betsy Stewart, Andres Tremols, and me. We’ve staged projects in Cairo, Washington, DC (twice), Pretoria, Wichita Falls (Texas), Istanbul, and Aix-En-Provence. Projects are in the planning stages for New Orleans and Sao Paulo. The upcoming Uruguayan collaboration came about through my friend Vivienne Lassman, an independent curator here in DC, who is also a close friend of Jessica Racine-White (daughter of dearly departed DC art patron Herb White). Jessica, who has a second home in Montevideo, mentioned to Vivienne that she wants to get more involved in the Uruguayan art scene. Vivienne, who has served as a TMTTR curator in previous projects, told Jessica: “You’ve got to get TMTTR to do a project in Montevideo.” From that suggestion, to help make it happen, Jessica identified for us a group of six Uruguayan artists who already work together in the same workshop. Over e-mail, a dedicated Facebook site, and phone calls, we devised a collaborative project with several parts. First, the fifteen artists were divided into five groups of three; each group has a mix of Uruguayan and TMTTR artists. Through a dialogue and the exchange of imagery via the internet, each group is creating a triptych, all of which should be more or less completed before TMTTR artists arrive in Montevideo. When I and the other TMTTR artists arrive in Montevideo, we will work with our Uruguayan colleagues for ten days to create a large-scale collaborative work; each artist will have a wooden surface of the same size to work on. The artists will be looking at each other’s work in progress and visually jamming, as musicians do. The Uruguayan artists have arranged for an exhibition of the project’s work at one of Montevideo’s most prestigious art venues -The Iturria Foundation. I come to the art world from an international affairs perspective. My first career was as an international economist, specializing in technology transfer issues for a variety of DC-based consulting firms, and as a Soviet affairs expert. My last “real” job was as a civilian employee for Air Force Intelligence, where I was the current intel expert on Soviet / East European political, economic, and ground force issues. In that job I worked deep in the Pentagon in a vault. But all during school, college, and afterwards, I painted feverishly in my free time, and morphed into a full-time artist in the early 90s. For more than a decade, TMTTR has given me wonderful opportunities to travel and present my work. In creating with people in these other places around the world I become more immersed in a location’s culture, and gain more understanding of it. TMTTR is personally important to me because it is a bit like a family, with members like brothers and sisters. We don’t always see eye to eye, and conversations can get lively, but in the end we move forward together into a new experience. When creating art alone in my studio I must take it on faith that the long studio hours will result in some positive contribution, however small, to the world I live in. Through Take Me to The River projects, even again as the contribution may be very small, I feel as if I am more directly and concretely doing a good thing, promoting understanding and harmony between people around the world. The upcoming project in Uruguay will be the first TMTTR project in South America, and the first to feature collaborative work with other artists, something we are all very excited about. 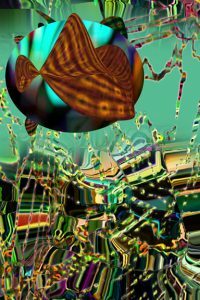 Richard L. Dana is a self-taught artist who creates art, both large and small scale, in a range of media, including digital art, mixed media painting, drawing, and installations. 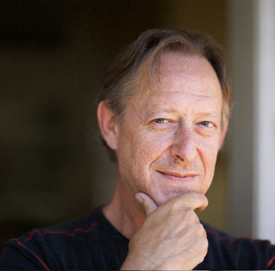 He has exhibited extensively in the United States and internationally in 25 one-person and over 100 group exhibitions. Selected venues in the United States include the Corcoran Gallery of Art (Washington, DC), the Chrysler Museum (Norfolk VA), the Octagon House Museum (Washington, DC), the Drawing Center (New York, NY), Tribes Gallery (New York, NY), the Print Center (Philadelphia, PA), the International Monetary Fund (Washington, DC), Maryland Art Place (Baltimore, MD), the Washington Project for the Arts (Washington, DC), the Wichita Falls Art Museum (Wichita Falls, Texas), and the Troyer, Fitzpatrick, Lassman Gallery (Washington, DC). Internationally Mr. Dana has exhibited in museums, galleries, and biennials in the following countries: Belgium, Brazil, Egypt, Germany, Italy, Japan, Kazakhstan, Morocco, Russia, Senegal, South Africa, Spain, Taiwan, Turkey, Uzbekistan and Vietnam. 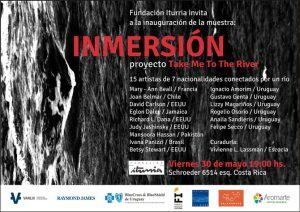 Immersion, a project of Take Me to the River, featuring fifteen artists from seven countries, will open on May 30th, 2014 at the Iturria Foundation in Montevideo, Uruguay.